"have responded to the urgent need to improve their employees’ health, productivity and quality of life." 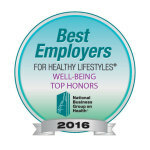 LOUISVILLE, Ky.--(BUSINESS WIRE)--Humana Inc. (NYSE: HUM) received Well-being Top Honors in Washington, D.C., this week as one of the top five companies among all national applicants for the Best Employers for Healthy Lifestyles® award, given by the National Business Group on Health (NBGH) to recognize organizations with the best workforce well-being programs in the U.S. In addition, Humana was named a Platinum award winner for the fourth consecutive year, the highest award distinction. The Best Employers for Healthy Lifestyles® award program recognizes companies with a well-being strategy shown to improve employee health and productivity and business performance, particularly those with a holistic approach to well-being, encompassing financial, emotional, social, and community well-being. Humana has driven such efforts for several years, embracing a whole-person well-being view focused on improving people’s sense of Purpose, Health, Belonging, and Security. The special Well-being Top Honors recognition was awarded to Humana for achieving strong results in these broader areas of focus and for connecting employee, family, and community well-being to business performance. 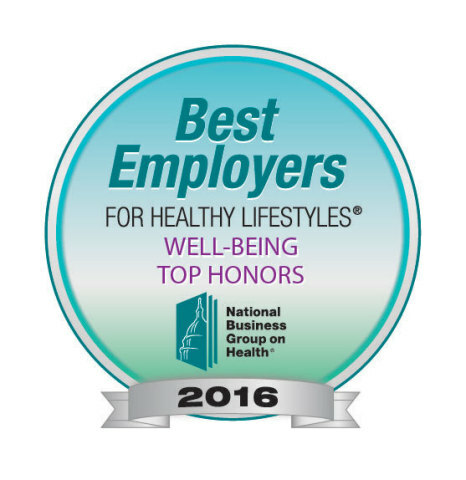 “Humana’s focus on financial well-being, resilience and emotional well-being, community and social connections, as well as job satisfaction and overall physical health offer an example and challenge to other employers striving to improve employee health, well-being and productivity,” the NBGH judges said. Through experiences like paid volunteer time off, network resource groups, flexible work arrangements, financial counseling or participating in an annual 100 Day Dash step challenge, Humana associates remain engaged together. They set collective, team and individual goals, measure progress, and celebrate successes. HumanaVitality, Humana’s health and wellness rewards program, encourages healthier lifestyles and supports associates with resources, health coaching, and other tools along the way. The strong commitment to well-being has helped Humana earn world-class employee engagement rates - consistently in the top 10th percentile of the Kenexa IBM World Norms database of over 16 million employee responses for the last five years - showing that associates understand and appreciate the commitment to helping them build balanced lives. As Humana’s associates have unified around the purpose of improving health and well-being, they’ve brought that same passion to the members and communities they serve in their business each day.